Students at IAST are so well rounded that at the end of three years they find offers pouring in from the best names in the industry. In fact companies absorb most of the students directly for placement after industrial training. 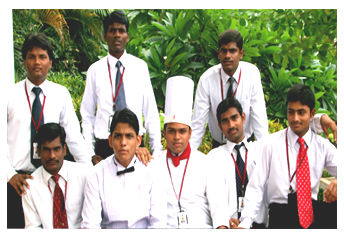 Major companies such as Hyatt, Marriott, Windsor Manor, Leela Kempinski, Taj recruit students of the institution every year. Students begin their careers as assistant chef, management trainees, and operation trainees and then grow to the positions of Front office mangers, FnB managers and even General Managers. 70% of them have settled abroad in good properties. About 5% of them have turned entrepreneurs managing their own restaurant, hotels and facilities services companies. The program allows the student to explore even wider avenues like event management, travel management, tourism, BPO without limiting the career scope just to hotels and restaurants. A placement Department works closely with industry for industrial training, placements and curriculum design. IAST has a track record of 100% placement till date more importantly in good companies that provide the right environment to the student to embark their career in ubiquitous hospitality and tourism industry.